Thousands march on API to "Stop the Frack Attack"
On the 28th of July, thousands of opponents of natural gas fracking marched from the US Capitol to the American Petroleum Institute, with an intermediate stop at the American Natural Gas Association. 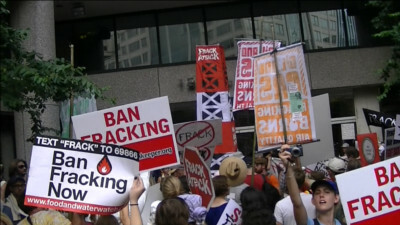 Audio Report posted elsewhere by WSQT Radio: http://dcimc.alchymedia.com/sites/default/files/audio/H_Stop_The_Frack_Attack_7-28-2012_Radiomix.mp3 (filtered html FAILED, displayed as plain text). The rally at the Capitol and march theafter focussed on the incredible destruction wrought by hydraulic fracturing for gas, which has literally "fracked up" so many communities. In some places it is even possible to ignite gas that flows with the water from people's taps near fracking sites. At the American Natural Gas Association. protesters in white biohazard/chem suits displayed foul looking well water in milk jugs, well water contaminated with "frack water" from gas hydraulic fracturing operations. When the march got to API, protesters blocked all access to the building by the main entrance, erected and then knocked down a mock drilling rig, and blockaded the doors with a sit-in. Eventually everyone moved on Franklin Square for closing.